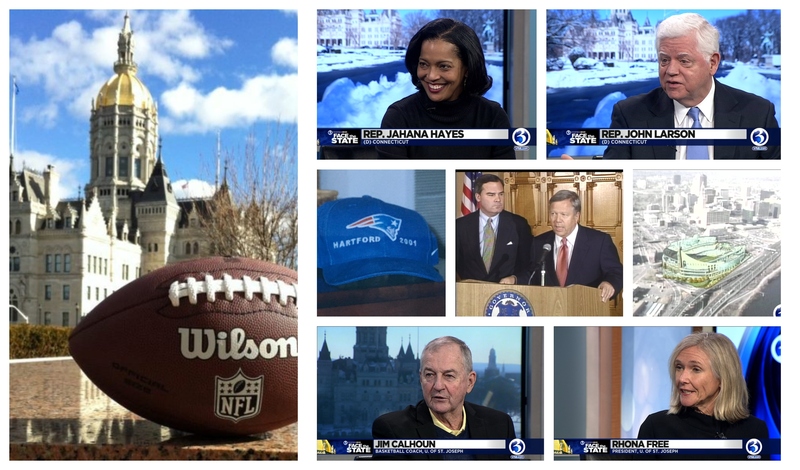 For Super Bowl Sunday we have a dynamic lineup of guests: Congressman John Larson, Congresswoman Jahana Hayes, legendary former UConn Coach Jim Calhoun and University of St. Joseph President Rhona Free. Larson and Hayes will talk about social security, President Trump and his call for a border wall, and the efforts by some fellow members of their Democratic party to begin impeachment proceedings against the President. Calhoun and Free will talk about the historic transformation going on at USJ led by Calhoun’s decision to become head coach of their inaugural basketball team. Also on the program, an appropriate flashback for Sunday: a report from April 1999 when Patriots owner Bob Kraft backed out of his deal to move the team to Hartford. Tune in Sunday morning at 8:30 on WFSB.